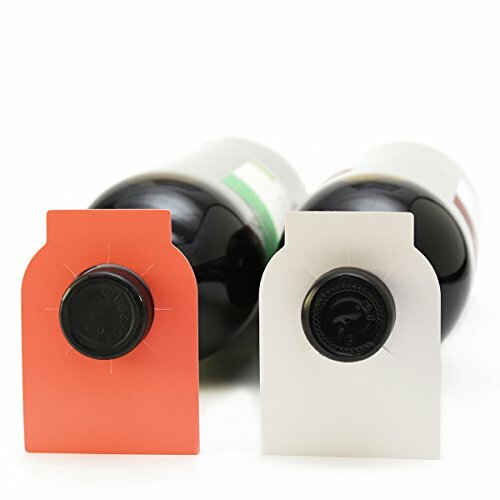 WineSpark wine bottle tags allow you to quickly organize your whole wine collection and will make it look superb! The unique, double sided design and premium tear-resistant paper makes it the most versatile yet eco-friendly choice that is available for us wine enthusiasts. You can trust that every detail has been carefully designed. The red color is lighter (not dark red) on purpose so that text is easy to read even in dimly lit wine cellars or rooms. We even added a special protective coating that makes the tags more durable and allows dry erase markers to be used and wiped off if needed. By buying WineSpark wine bottle tags you get complete freedom since our tags can be used just the way you want. Include any information you want, use any pen you want. Dispose them after use or use them over again. Our tags are used not only at home but also by restaurants and have been designed for professional use. As a small family run business we offer all our customers a 100 % money-back guarantee if you're not satisfied with our products. Buy this great product today! Thick high quality paper. More durable than normal paper yet eco-friendly. Reusable with dry erase markers. Tear resistant and long lasting due to special protective coating, which also protects from wrinkling. Red-white color coding to organize different varietals, homemade wines, homebrews, live sale cloths etc. Perforated to fit any wine and champagne bottle neck. These dual-colored labels are completely blank. Super easy to write on - any kind of pen will do. Dimensions 2¼ (width) x 3¼ (height) inches. If you have any questions about this product by WineSpark, contact us by completing and submitting the form below. If you are looking for a specif part number, please include it with your message.